Having fun with digital photography. Over the past couple of years I have been blogging tutorials on Photoshop Elements. When I started the latest version was PSE 15. When it was replaced with PSE 2018, I used screen shots from it for subsequent tutorials. I did the same when PSE 2019 was introduced. Almost all of the tutorials are based on updated versions of my class handouts I used when I was teaching Photoshop Elements. The links are to PDF files for the most part which can be downloaded and printed if desired. There are also a few videos included. The tutorials cover both the Organizer and Photo Editing using Elements. Click on the image below to go to the webpage that has the complete list. Tiny Planet images have become quite popular on phot sharing sites and in social media sites, such as Facebook. To create a Tiny Planet image, you generally must start with a spherical or 360-degree panorama. Using drone or special 360-degree cameras make it easy to take and stitch the individual photos together. This AppTip Sheet describes how to create a Tiny Planet image using Photoshop Elements. It begins with a 360-degree panorama shot with a Mavic Pro or similar drone and previously projected with a program such as okolo.com. There are many programs and websites that can produce Tiny Planets. However, using PSE to create it allows you to produce a high resolution image, and also allows you to the image. Click on the figure above to display or print the PDF of the AppTip Sheet. If you found it helpful and interesting don’t hesitate to Like or Share it below. 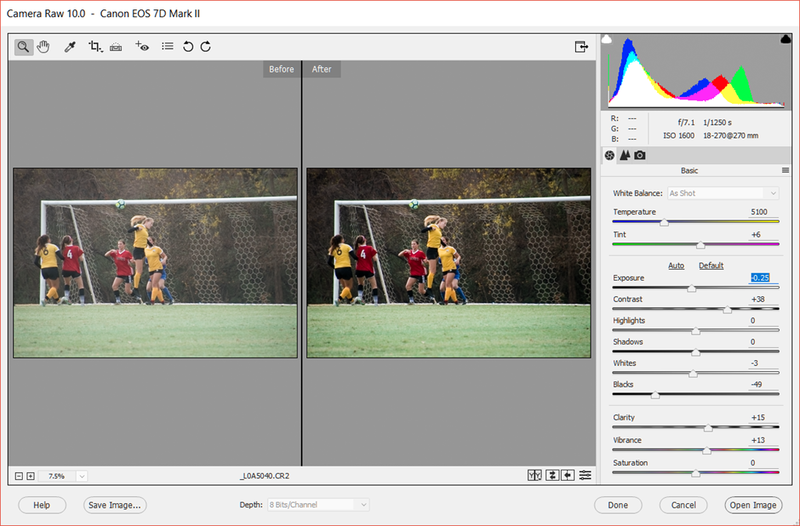 One of the recurring topics that routinely show up in Photoshop Elements forums and social media is what are differences between different versions of Elements, and is it worth upgrading. Whether it is worth it or not is certainly up to the individual, but having a idea of what each version adds (and on occasion removes) is the first step in making your decision. Sometime ago I put together a table that compares the current version to an earlier one. The PDF file that is linked below is my latest version of the table. It compares PSE 11 through PSE 2018. Hopefully, it will of some help to those who have struggled with the question of whether or not to upgrade. Let me know if you found this table helpful. Don’t forget to explore my blog for other helpful digital photography articles and tutorials. Over the past several weeks I have posted tutorials on using the Adobe Camera RAW (ACR) in Photoshop Elements 2018. If you missed them, their links are shown below. In this post, I have added the final tutorial in the series. It covers using the Detail and Camera Calibration panels of the ACR. As shown in the figure below, the Detail panel is where you go to sharpen and reduce the noise in your RAW images. To view or print this tutorial, click on the link below. I hope you have found these tutorials helpful. If you have please rate it according and share with others over social media. In recent posts, I have covered the basic workspace of the ACR, the general approach for processing RAW files, and the Basic Panel sliders. This post is a short tutorial on the using the ACR’s Tools. To view or download the tutorial, click on the figure below. In this tutorial, we will cover the Basic editing panel in PSE 2018’s Adobe Camera RAW (ACR) editor. If you select a RAW image in the Organizer to edit, it is the ACR workspace that opens. Specifically, the tutorial deals with the Basic sliders on the right side of the workspace. The other screen such as Details etc will be covered in later tutorials. However, using the Basic sliders is often all you need to greatly improve your image. And remember, most every RAW image needs some adjustment, since it has not been processed by your camera before being written to the memory card, like JPEG images have. Click on the figure below to view and/or print the tutorial. In the next tutorial, we will cover the other screens in the ACR. If you found this tutorial helpful, leave a comment or Like it. In the post, I have covered the general process of using the RAW image editor in Photoshop Elements 2018, the ACR. We have one more topic to cover before getting to the fun part of editing your images, and that is a quick review of the screen layout, and Preferences. Click on the link below to view or download the tutorial that reviews the ACR workspace screen. Next time, I will cover how to effectively use the Basic panel shown in the figure above. Please leave any comments below, click I=on the Like button if you found this tutorial helpful.